Tillykke med fødselsdagen Kronprins Frederik....Danmarks fremtide kong! Happy Birthday Crown Prince Frederik...Denmark´s future king! I dags TRIVIA: Ved du at Frederik og Mary og Dronningen har ikke et efternavn? De er lige Kronprins Frederik og Prinsesse Mary og Dronning Margrethe! Today´s TRIVIA: Did you know that Frederik and Mary and the Queen do not have a last name?! They are just Crown Prince Frederik, Princess Mary and Queen Margaret! Why don't they have a last name? He's just gorgeous isn't he? Margrethe Schleswig-Holstein-Sonderburg-Glücksburg? Or even worse Margrethe von Schleswig-Holstein-Sonderburg-Glücksburg? It's true that they don't have a last name, but the queen and the crown prince actually both have 4 first names. Queen Margrethe II's full name is Margrethe Alexandrine Þórhildur Ingrid. Her official title is Her Majesty The Queen of Denmark. 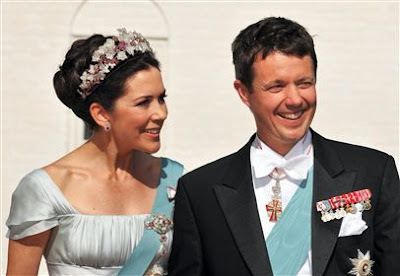 Crown prince Frederik's full name is Frederik André Henrik Christian. His official title is His Royal Highness The Crown Prince of Denmark, Count of Monpezat. Crown Princess Mary's full name is Mary Elizabeth. Her official title is Her Royal Highness The Crown Princess of Denmark, Countess of Monpezat. Her maiden name was Mary Elizabeth Donaldson. Does that mean that my daughter won't have a last name when she marries the new baby prince?